Biography* � Charles Emory Culpeper (1874-1940) was born in Rome, Georgia to a farm family of nine children. Although he never finished high school, he was an industrious young man who worked as a store clerk in the Rome area and later as a traveling salesman. In 1899, Culpeper accepted a job selling Coca-Cola syrup to soda fountains in Philadelphia. In 1904, he was transferred to New York, where he worked as a salesman for the Coca-Cola Bottling Works of Newark and of New York. In 1917, Culpeper bought the two companies for $160,000 and combined them into the Coca-Cola Bottling Company of New York. The company prospered under his direction, and at the time of his death in 1940, his stock in it comprised the bulk of his substantial fortune. Biography � The Charles E. Culpeper Foundation was incorporated on December 17, 1940 under section 113 of the Not-for-Profit Corporation Law of the State of New York. The Foundation holds a certificate of exemption from federal income tax under the provision of section 501(c)(3) of the Internal Revenue Code of 1954. Charles Emory Culpeper, one of the pioneers in the bottling and marketing of Coca-Cola, was born in Rome, Georgia on May 11, 1874. 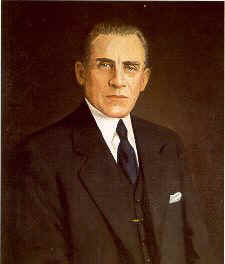 He died in New York City on February 2, 1940 at the age of 65. In his will Mr. Culpeper directed that a Foundation be established to acquire ultimately the bulk of his fortune and apply the income and, if need be, the principal to charitable, religious and/or educational purposes, requesting however that the greater part of the principal be conserved for the benefit of future generations. Upon Mr. Culpeper's death, leadership of the Foundation fell to his friend and attorney, James T. Murray, aided by his widow, Daphne Seybolt Culpeper. Mrs. Culpeper held the office of President of the Foundation until 1968. She resigned as President in 1968 and died in 1977. Mr. Murray, always an officer and in the forefront of the Foundation's activities, became Chairman in 1958 and died in 1968. Mr. Culpeper was the son of a Baptist minister whose wife's parents had been killed by northern troops during Sherman's march in the Civil War. He was raised as one of nine children on the family farm in Curryville, a section of Rome, Georgia. Although he never finished high school, he was an industrious young man first working as a clerk in a country store in the Rome area and later as a traveling salesman. Some time in the mid 1890's, the young Mr. Culpeper decided to leave the Rome area and went to Baltimore and then to Philadelphia. While in those two cities he sold coffee, managed a crew of house-to-house canvassers and then worked in an all-night restaurant in Philadelphia. In 1899, Mr Culpeper accepted a job selling Coca-Cola syrup to soda fountains in Philadelphia. In 1904 he was transferred to New York, where he worked as a salesman for the Coca-Cola Bottling Works of Newark and of New York, two companies which were the New York area distributors of Coca-Cola. In 1917 Mr. Culpeper bought the two companies for $160,000 of borrowed funds. Subsequently, with Mr. Culpeper at the helm, the New York and New Jersey companies were combined to become The Coca-Cola Bottling Company of New York. The company prospered under Mr. Culpeper's leadership so that at the time of his death in 1940, his stock in it comprised the bulk of his substantial fortune. Although Mr. Culpeper became a resident of Norwalk, Connecticut in 1913 and lived there until his death, he never forgot his roots in Georgia. He owned a farm, was a frequent visitor there, built homes, installed utility services for family members and provided many of them with financial support. Knowing what it had been like to be a poor boy in rural Georgia in the late 19th century, he was very interested in the welfare of children although he had none of his own. He frequently made his estate in Norwalk, Connecticut available to boys from the slums of New York City for picnics and outings, and through his Rotary Club membership he was instrumental in assisting boys' clubs generally in the New York area. He is buried, along with his parents and other family members, in the cemetery at the West Union Baptist Church in Curryville. Biography � Although his surname was CULPEPPER at birth, he later amended his surname to CULPEPER omitting one of the p's. As a small boy, Charles stubbed his toes on many a rock in the Rocky Creek Valley, but more than that, he was imbued with great ambition. As a teenager, he decided that there were "greener pastures" than the ones surrounding his home in the Rocky Creek Valley lying between Curryville and West Union Baptist Church - therefore, he ran away from home. In Atlanta, Georgia, he made the acquaintanceship of Asa Candler, who was struggling to sell and popularize a soft drink that he called COCA-COLA. It was decided that if COCA-COLA ever became a popular drink in the United States, it would need some sales representatives to carry the word to other parts of the nation. So it was decided that Charles would be sales representative to New York. Without hesitation, without any knowledge of the City of New York, Charles departed for New York City. Upon arriving in New York City, Charles saw that the market there was much too large for him to tackle alone. Therefore, he wrote back home and asked his younger brother, J. Frank to join him and they frequented the night clubs of New York trying to sell bottles of COCA-COLA. Several years ago, during the life-time of J. Frank Culpepper, I talked to "Mr. Frank," as we called him and he said that if they sold two or three bottles in a single night that they would rejoice on having a very successful night. Their persistence was rewarded by the public, who discovered that COCA-COLA was a very remarkable drink. Charles Emory Culpeper, who was born on May 11, 1874 and died on February 3, 1940, never lost his love for the place of his youth and for his father and mother. He employed one of the finest carpenters of Gordon County, Mr. Robert Gresham, of the Curryville community, who was in charge of all construction on the Culpepper Estate and the Culpepper Mansion was built. It was the show place of Northwest Georgia. Charles was a frequent visitor to his old homeplace throughout his life-time. Although the Culpepper Mansion has now been destroyed by fire, the place is still known as "The Culpepper Place" and, in all probability, will be so known until the end of time. Biography � Charles Emory was just five years younger than my father. He was slight build with light brown hair, but he had a double amount of the Culpepper eyes (light blue and sharp) and had inherited Chas. Wm's (his grandfather Culpepper's) charm. ...Now all these people [Elam Culpepper's family] were attractive but nothing out of the ordinary except Charles and now I want to tell you about him. I think he was born in middle Georgia and at the age of 15 he left home. He had no education above grade school. I do not know what else happened to him but he finally was working for Mr. Asa Candler of the Coca-Cola business in Atlanta. While still a young man, he was sent to Philadelphia and then to New York City for the Coca-Cola Company. You will realize how long ago this was when I tell you that he was a charter member of the Manhattan Rotary Club and owned one of the first automobiles. He was very fond of all children but unfortunately had none of his own. But he became concerned about the young boys who were growing up in the streets of New York and wanted to do something for them if possible. He owned a place at Norwalk, Conn. with a large two hundred year old house and about 100 acres of land which he did not cultivate but just left it in it's natural state and it became a sanctuary for birds and small animals. In the summer, he took a large group of boys there and turned them loose on the land. The next month, he brought another group, and so on until summer was over. He became sort of famous for this work and was written up in the national Rotary magazine for it. After many years there for the Coca-Cola Co. he organized the New York Coca-Cola Bottling Co, and was it's president until his death around 1940. They had bottling plants in N.Y., Brooklyn and New Jersey Binghamton & Poughkeepsie and I don't know where else. In the meantime, he had bought up his grandfather's old farm and his own father's and some other adjoining land (in Gordon Co. GA.) and said it was for all by the name of Culpepper who needed a place to live. He restored the two old homeplaces, and built nice little brick houses for his workers to live in. By this time, his parents were old and in poor health and he spent more time down here. He had a room at the old Harbin Hospital where they could be brought when they needed it. No son I ever heard of has done as much for his family and kin as he did. His parents died before he did and were buried at West Union Cemetery in Gordon County, where the grandparents were buried also. When he died around 1940, his body was brought by private Rail Road car and he was buried there, too. He left an estate valued at $10 million. In his will, he wanted the bulk of that to go into a foundation to carry on his work with the poor and underprivileged. He also left yearly incomes to his brothers and sisters and his Aunts and Uncles. At their deaths those sums go back into the Foundation. There is a building in downtown Manhattan with this inscription: "The Chas. E. Culpeper Foundation." Biography � He was the protégé of Asa G. Candler, the founder of the Coca-Cola Bottling Company. This old man loved Charles better than his own sons, and could always depend on him. (When he was building his Mansion in Druid Hills, Atlanta, Mr. Candler and his wife went to New York to buy the furnishings. They stayed with C.E. and his wife, Mary, and did not buy one thing until C.E. and Mary approved it). Charles was the President of the Coca-Cola Bottling Company of New York State. He lived in New York City, and also owned a country estate at Norwalk, Conn. His country place was a bird sanctuary. He had several peacocks, some white, some colored, that roamed the lawns. He also had a few very rare birds in large pens. Charles had a striking personality. And, although he was small in statue and walked with a decided limp (caused by an accident when he was a child, a dislocated hip which over the years had formed a new socket). When he walked into a hotel or restaurant , all the bellhops and waiters and Waitresses, jumped to attention and served him gladly. People liked him on sight. He was popular , enthusiastic Rotarian, and no matter where he was on Thursdays, he always went to the meeting in that town. He was involved in helping the boys from the slums of New York City. Each summer they let some of them camp in a wooded area on his estate, and was active promoter of the Boy's Club in the city. He belonged to the famous Actor's Club, called "The Lambs Club". He was a patron of the arts especially the theatre. At this death he left a large sum of money to "The Charles E. Culpeper Foundation", Which over the years has given large sums of money to schools, colleges, churches and the arts. Biography � Charles told Judge King, "earning the first million was hard, but after that, the others came easily." At his Rome, GA funeral final rites, two train carloads of flowers arrived! Charles E. Culpeper Foundation 50th Anniversary Report 1990, Stamford, CT: Charles E. Culpeper Foundation, 1990.
p 3 Rome, Floyd Co, GA.
Delaware Vital Records, compiler, Delaware Marriage Records, 1806-1935, Online database at Ancestry.com, 2010. Charles E. Culpepper, Male, and (unknown) Female, married in 1904 in Delaware. Mrs. Colepepper, Wife, Female, 40, Md, GA/GA/SC. New York Times, Feb 3, 1940, p 17. Rockefeller Archive Center at Rockefeller University http://archive.rockefeller.edu. Foreword from the Charles E. Culpeper Foundation 50th Anniversary Report 1940-1990. Harbin King, in his column Judge King Says from the Calhoun News Dispatch. Letter of 27 Sep 1978 from Mrs. W. B. (M. Louise Culpepper) Broach about her first cousin, Charles Emory Culpepper. As transcribed by Gayle L. Poole. James Burie Clegg letters to Lew Griffin on 15 Nov 197 and 16 Nov 1978.